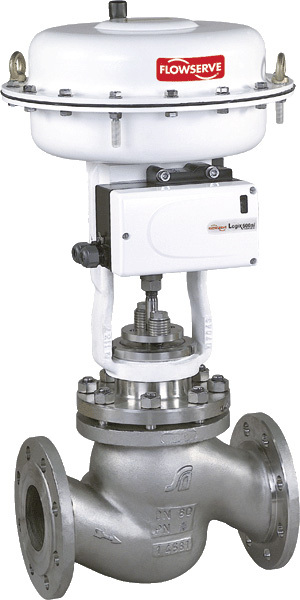 The Flowserve FlowTop control valve is a high-performance, general application valve coupled with the high-thrust FlowAct pneumatic diaphragm actuator. The modular design allows by using the same body with different types of bonnets, trims and actuators, the reduction of spare parts and offers an interchangeable valve for a broad range of industries and applications. The FlowTop valve is capable of operating within temperature ranging from -200 up to +538°C (-328 up to +1000°F) according to the selected material. The FlowTop control valve offers a sturdy plug head guide for minimizing vibrations and wear.